(Kochi, Jan 07,2019):The Kerala High Court on Monday passed a fresh order banning hartals in the state without a notice of seven days. The bench comprising Chief Justice Hrishikesh Roy and Justice AK Jayasankaran Nambiar said that a ‘flash’ hartal was unconstitutional and that it needed to be announced at least seven days in advance. During those seven days, the bench added, any citizen can challenge the declaration of the hartal. The PIL in this regard was filed by Kerala Chamber of Commerce and Industry, which stated that 97 hartals had taken place last year which led to loss of crores of rupees. Hartals and lockouts have continued to be a major problem in Kerala over the last few years. In numbers, Kerala observed at least 363 hartals between 2005 and 2012. The state witnessed as many as 97 strikes and hartals in 2018 up till December 17. The reasons vary from social and political to economic factors, such as rise in fuel prices and the Sabarimala row. According to data compiled by the ‘Say NO to Harthal’ movement, 33 strikes were called by the BJP, 27 by the Congress-led United Democratic Front and 16 by the Left Democratic Front. In 2017 too, Kerala had witnessed at least 98 strikes. "Every hartal is called without any sincerity to the issue. We know that no party has consistently campaigned against those issues other than just holding a hartal. They call these hartals as a token protest, because it is the ‘in’ thing to do. 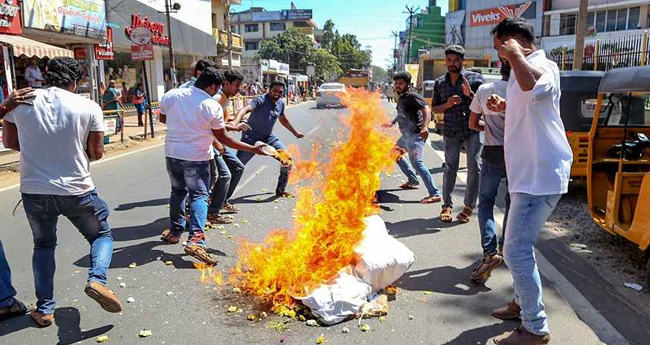 You just send out a press release and Kerala comes to a standstill," said Raju P Nair, general convener of Say NO to Harthal' movement and district office-bearer of Kerala Congress. Each hartal burns a Rs 200 crore hole in the state’s economy, as per CCCI estimates. Frequent hartals have hit Kerala’s Rs 29,000-crore tourism industry badly and the “negative impression created by these unwarranted strikes, wherein vehicles are blocked and tourists threatened, has resulted in numerous cancellations”. Educational institutions are also one of the victims of regular hartals. On Saturday, Kerala Federation of CBSE and ICSE schools called for schools and colleges to be included in the list of essential services so that they can escape the consequences of frequent strikes. According to the Ministry of Labour and Employment, Kerala lost around 2.1 lakh, 2.11 lakh, 2.94 lakh, and 1.53 lakh of man-days (a unit of one day's work by one person) due to lock-outs in the state’s industrial sector in 2014, 2015, 2016 and 2017 (till October), respectively. The loss was 1.71 lakh, 4.04 lakh, 1.65 lakh and 1.37 lakh days during the same period on account of general strikes.